Plate heat exchanger framework is composed of fixed and moveable plates (including baffle, the intermediate plate), upper and lower guiding bars, columns, tightening bolts, anchors, etc. Note: fixed and moveable plates (including baffle, the intermediate plate) can be coated by 0Cr18Ni9, 0Cr17Ni12M02. 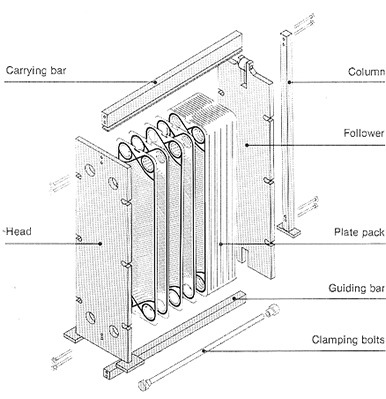 Large plate exchanger: Using the I-beam, H-beam. Commonly used Q235, 35, and stainless steel 304.
column: Using the U-section steel, I-beam, H-beam. Commonly used Q235, 35, and stainless steel 304. When you select materials, it is necessary to consider their working conditions: for example using stainless steel materials on food machinery. Choosing container plate, intensity is higher than carbon steel, but the price will be higher. Choosing alloy steel/quality carbon steel, intensity is higher than that of carbon steel, but need a higher price and longer delivery time. The intensity of stainless steel is lower than carbon steel. Please take into consideration the influences of various factors.